This quick & easy Skinny Fettuccine Cauliflower Alfredo is rich, creamy & delicious. It also happens to be really low in calories & virtually fat free! Rich and creamy pasta dishes are one of my all time favourite things to eat, but let’s be real. They don’t do your waistline much good, especially if like me, your portions are probably a lot bigger than they should be! And even though with vegan versions you lose the butter, cream and parmesan, you often end up using vegan butter and blended cashew nuts as replacements which ends up packing in the calories. The answer? 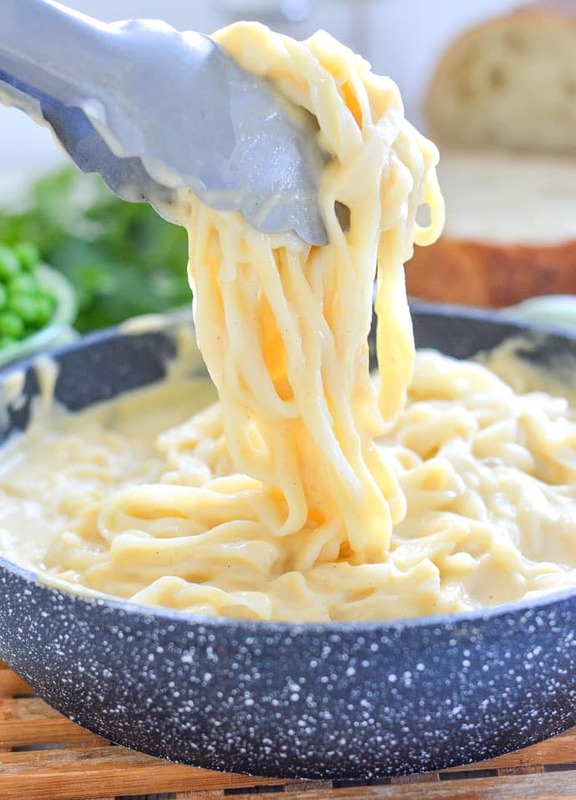 Skinny Fettuccine Cauliflower Alfredo. It is made skinny by using steamed cauliflower as a base for the sauce. ???? Yes…We are totally skipping the calorie-laden ingredients today and making a rich and creamy sauce from a big white vegetable! Bear with me please. I haven’t lost the plot…???? Obviously the sauce doesn’t taste quite like a traditional Alfredo but it is still super creamy, rich and delicious. You will be amazed at how creamy the blended cauliflower gets and because cooked cauliflower is soft, you don’t need a high powered blender to make it silky smooth like you do with nut-based sauces. I’ve even tried it in my food processor and got a great result. I’m not going to lie. It does taste of cauliflower. So, if you don’t like cauliflower, please don’t make it. If you want something more decadent and authentic tasting, give my Baked Vegan Mac and Cheese or my Vegan Carbonara a try instead. It is super creamy, rich and delicious though, and coats and clings perfectly. Plus it is super-duper healthy. And, what a fun way to get your cruciferous veg in?! 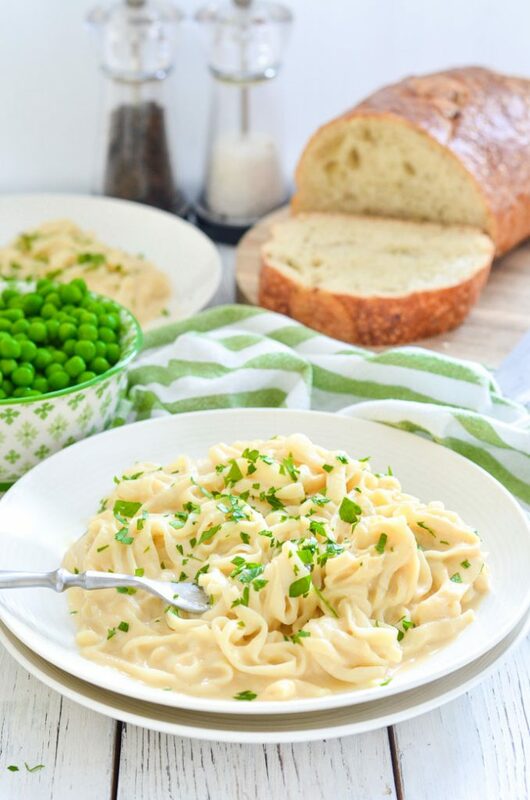 This Skinny Fettuccine Cauliflower Alfredo is very low in calories and virtually fat-free. Obviously adding a pile of regular fettuccine into the mix raises the calories substantially so bear that in mind, but, if you are wanting to really cut calories and still eat a big ol’ plate of pasta you could try nuPasta. 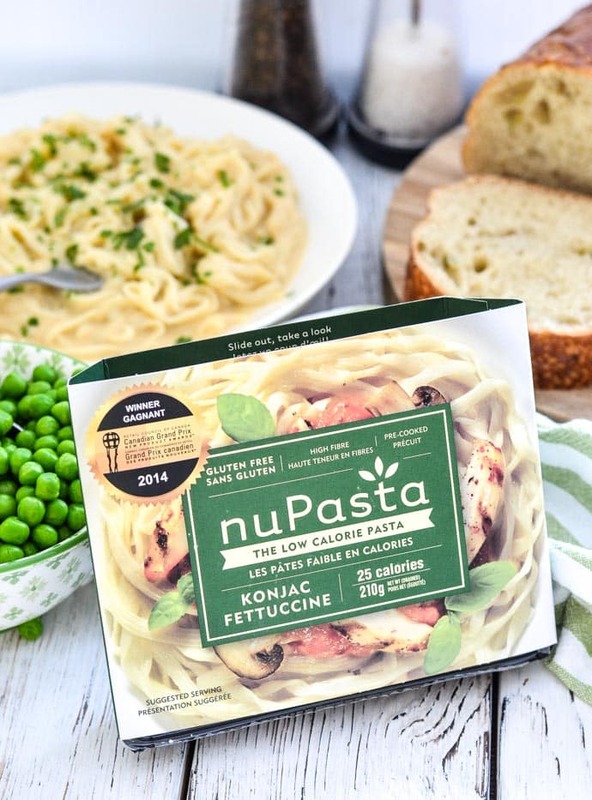 Unlike regular starch based pasta, nuPasta is fibre based. It is made with the konjac plant, a root vegetable whose main component is glucomannan, a water soluble dietary fibre. It comes pre-cooked in packages like the one in my photo above and is shelf-stable so does not need to be refrigerated. It is a perfect option for anyone who eats gluten-free or is diabetic, as well as anyone watching their weight or restricting carbs. Get this? It has only 25 calories per portion. It is completely carb free and is packed with fibre. It’s kind of unbelievable. I struggled to get my head around the idea that something with so much substance can be so low in calories. But it is, and combined with my Skinny Alfredo Sauce it makes for an extremely low calorie, low fat dinner. 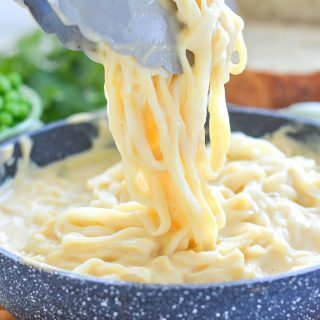 I love to serve this Skinny Fettuccine Cauliflower Alfredo with a side of peas. There is something about the pop of green colour and the little bursts of sweetness amongst the fettuccine tangles that I love. It also works well with a crisp green salad or just a sprinkle of fresh parsley. To add some healthy fats make yourself some vegan parmesan cheese to sprinkle on top. 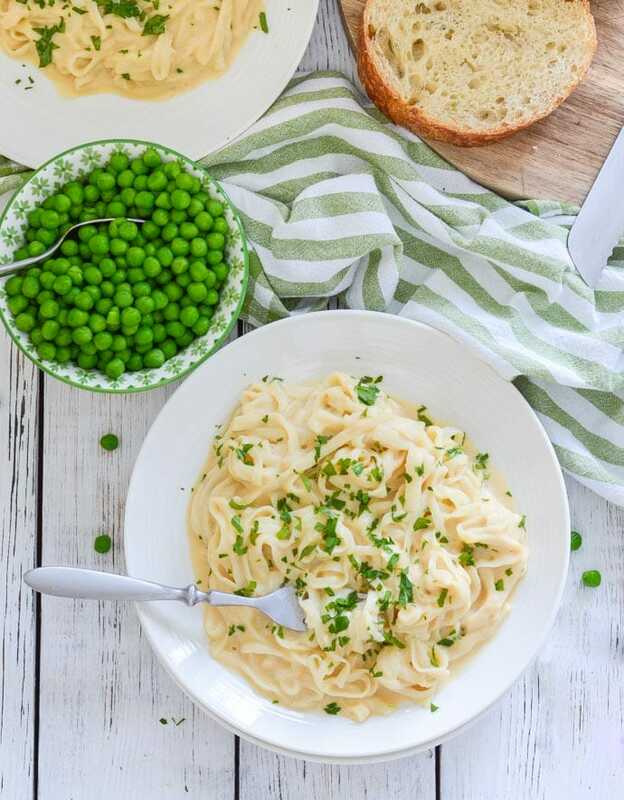 If you give this Skinny Fettuccine Cauliflower Alfredo a try, let me know what you think in the comments below and share your pics with me on Instagram. I love to see! 90mls / ¼ cup + 2 tablespoons non-dairy milk , use a much as you need to get the sauce the consistency you like . You might need a little more or less. Cook the cauliflower until fork tender. I like to steam it but you can boil it if you prefer. Drain and add to a blender. While the cauliflower is cooking gently sauté the onion until transparent then add the garlic and carry on cooking until it is just starting to turn golden. Remove from the heat and add to a blender. Add all of the other ingredients to the blender, EXCEPT the milk and fettuccine. The olive oil is optional but makes the sauce glossier if added. The miso is optional but helps the flavour so if you have some please use it. It's still good without though so don't worry too much. When cooked, drain the cauliflower and add to the other ingredients in the blender then blend until completely smooth. This might take a few minutes, especially if you don't have a high powered blender. Add the milk gradually as needed until the sauce is the consistency you want. You might need slightly more or less than stated. Remove from the packaging and rinse in a sieve under a running tap for at least 20 seconds. Add the sauce to a large pan and warm gently. Once hot add the nuPasta Fettuccine. It is already cooked so will only take a minute or two to warm through in the hot sauce. Serve immediately. Bring a large pan of salted boiling water to a rolling boil then drop in the fettuccine and cook as per the packaging instructions. While it is cooking warm the sauce gently in a pan. Cook the fettuccine until al dente then drain and return to the pan. Pour as much sauce as you need into the fettuccine and stir gently to coat. Serve immediately. Alternatively serve with zoodles (zucchini noodles). Leftover sauce keeps well in the fridge for 3 - 4 days. Just warm gently in a pan when you want to use it. You might need to add a drop of vegetable broth or non-dairy milk to thin it out a little again. See suggestions in post for other ways to use leftover sauce. NUTRITIONAL INFO IS CALCULATED ON THE SAUCE ALONE AND ASSUMES ¼ OF THE TOTAL AMOUNT MADE IS ONE SERVING. THIS IS A PRETTY GENEROUS AMOUNT AND YOU WILL MORE THAN LIKELY END UP WITH SOME LEFTOVER. This post is sponsored by nuPasta. Thank you for continuing to support the brands who help make this site possible.